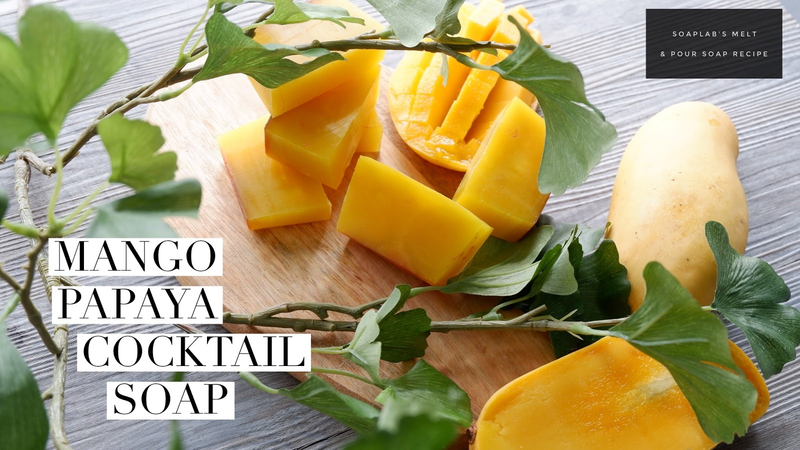 Today we will be a making a mango papaya cocktail soap. The soap will use a papaya soap base which is great in rejuvenating dry skin, making your skin softer and healthier. Next, we will add fresh mango juice. With the papaya soap base and the fresh mango juice, the amount of chemicals in the soap is drastically reduced. With such simple ingredients you are now able to make a soap which does not only look and smell great, but is also amazing for your skin. Fresh mango juice has a lot of antioxidants which moisturise the skin leaving the skin looking clean and healthy with a beautiful glow. Add mango papaya fragrance oil, giving the soap a delicious fruity and smell. Finally, add the sparkle wine red and yellow mica, leaving you with a beautiful and healthy soap.